It seems to be another article: There I was with my pen and paper ready. But before I began writing, I prepared for myself and the other people in the office, tea or coffee for those who so desired, and of course, Greek Coffee for Mr. Spyros Peter Goudas. Prior to this, Mr. Goudas had ordered some Guyanese Chinese Food which included: Shrimp Fried Rice, Stir Fried Mixed Vegetables and Deep Fried Chicken Wings. Mmmmm! Who can resist this?! As usual, he invited everybody. Needless to say, today the food was absolutely magnificent. Perhaps because the Caribbean Chinese cook their food a little differently form traditional Chinese food. Many people thing that because Mr. Goudas is in the food business, he is eating all day long. However, as explained before, he sometimes forgets to eat (sometimes for a whole day)even though at times his maid basically follows him around with a sandwich, coffee, tea or which ever beverage he prefers to drink. There was a glow on his face and a gleam in his eyes, like a kid with a big secret. 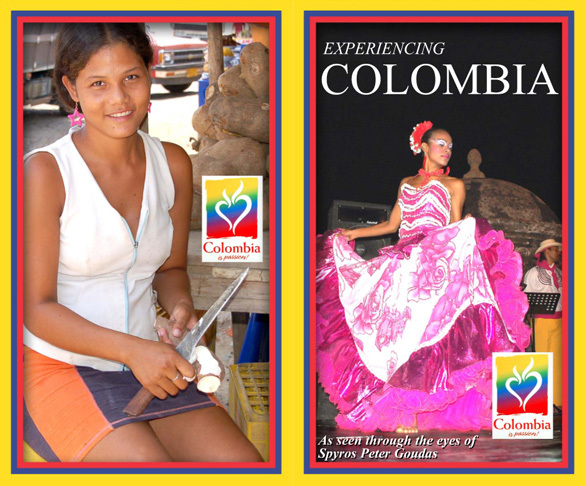 Experiencing Colombia: As seen through the eyes of Spyros Peter Goudas. According to the email, this book was on a program published in the monthly review magazine in Colombia and they claim it was the best book ever written about Colombia. This was on the monthly news of Colombia. After being enthusiastic literally by Colombia, Peter Spyros Goudas, of Canada,wrote a book in which he relates his experience in the country during the past Business Forum of Agroindustria, made in Cartagena. The publication reunites photographic material in that they are from typical plates to factories, agricultural products and national dances. Of equal way it describes, to chronicle way, his route by the cities of Cali, Cartagena, Bogota, Barranquilla, and Pereira, of who it emphasizes its architecture and cultural atmosphere. This is one more sample of what the passion of the Colombians obtains in the mentality of the international visitors. "Experiencing Columbia, as seen through the eyes of Spyros Peter Goudas". It finally received national attention in Columbia, a country with 48 million people. The publication has resulted in hundreds of e-mails to the company and to Mr. Goudas himself. Some refer to it as the best book ever written about Columbia from an outsider. At first it was a simple 4-page compilation of events at the Convention, then it turned into a book of wonderfully recorded memories and pictures. "This article was written to inform and educate those who are unfamiliar with Columbia, and to allow Columbians to experience a third party's impression of their country, as well as to feed the curiosity of those who wonder about its characteristics. The author wanted to express his thoughts on this beautiful country, sharing everything he learned about the people, the food and the culture. The pictures included were taken personally by the author, and displayed in this article to show the readers a very realistic view of Colombia". Please avoid taking your wife/girlfriend/companion to the emerald and gold boutiques: your pockets will be severely and irrepairably damaged. Native Colombian craft boutiques are so wonderful that they are hazardous to your wealth. The crafts are so beautiful, creative, and original, they attract women like bees to flowers. And believe me, I am speaking from a very personal point of view. There are seven women in my office and I had to purchase a souvenir for each one, especially, my private secretary who is turning sixty-nine years young! And refuses to retire! I purchased seven bracelets and necklaces at a very reasonable price from one of the street vendors who told me that they were real precious stones, including diamonds and emeralds. Since I am in the food business, I have no knowledge about diamonds and emeralds and I had no reason to doubt what so ever that a legitimate Colombian street vendor would lie to me. Upon my return to the office, I presented the precious presents to the ladies in the office. Each one immediately hugged me and I was graced with seven kisses.